^ Le Minh Khai （Liam Kelley ハワイ大学マノア校のベトナム史学者）. 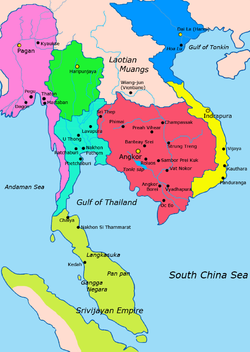 The Stranger Kings of the Lý and Trần Dynasties. https://leminhkhai.wordpress.com/2013/09/07/the-stranger-kings-of-the-ly-and-tran-dynasties/. ^ Lynn Pan. The Encyclopedia of the Chinese Overseas. Harvard University Press. pp. 228. ISBN 0674252101. ^ Cuong Tu Nguyen (1997). Thiền Uyển Tập Anh. University of Hawaii Press. p. 371. ISBN 978-0-8248-1948-4. https://books.google.com/books?id=12MEAAAAYAAJ&q=2%29,+points+out+that+according+to+a+Chinese+source,+Ly+Cong+Uan+was+originally+from+Fujian,+China.+Tran+Quoc+Vtfcing+is+of+the+opinion+that+Uan+himself&dq=2%29,+points+out+that+according+to+a+Chinese+source,+Ly+Cong+Uan+was+originally+from+Fujian,+China.+Tran+Quoc+Vtfcing+is+of+the+opinion+that+Uan+himself&hl=en&sa=X&ei=ZS7NVJOTAYi9ggSCw4GACQ&ved=0CB4Q6AEwADgy.